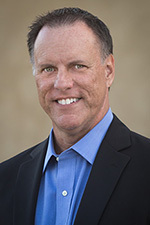 DirectAccess Load Balancing and Multisite Configuration Options Unavailable | Richard M. Hicks Consulting, Inc. 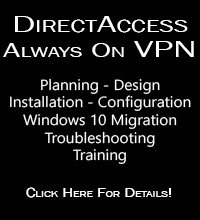 Looking for more information about DirectAccess load balancing? See my post entitled DirectAccess Deployment Guide for Kemp LoadMaster Load Balancers. 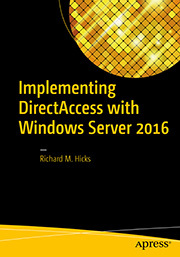 DirectAccess in Windows Server 2012 R2 supports load balancing and multisite configuration options to provide both local and geographic redundancy, respectively. To configure either of these options, open the Remote Access Management console, expand Configuration in the navigation tree, highlight DirectAccess and VPN, and then select either Enable Multisite or Enable Load Balancing in the Tasks pane. Depending on your configuration you may encounter a scenario in which these features do not appear in the Remote Access Management console. This occurs when the Web Application Proxy (WAP) role is installed on the DirectAccess server. Although this is a supported configuration, enabling load balancing or multisite on a DirectAccess server with WAP installed requires additional configuration. Specifically, load balancing and/or multisite must be configured before installing the WAP role. To restore support for load balancing and multisite configuration options, remove the WAP role using the GUI or with the Uninstall-WindowsFeature Web-Application-Proxy PowerShell command. Your configuration is correct. And yes, when configuring DirectAccess for use with an external load balancer, two dedicated IP address (DIPs) are required. However, you can safely use only the external DIP on the load balancer as long as you are not using the default configuration for the web probe host URL. See the following post for more details.